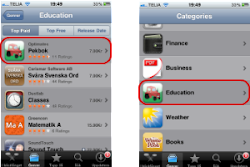 Pekbok till iPhone o iPad: Smoking hot v1.7 of Pekbok is out there! Smoking hot v1.7 of Pekbok is out there! Our Picture book Version 1.7 is finally available! Observe the Skånska (skånish?) flag! Yes, The kids are real.